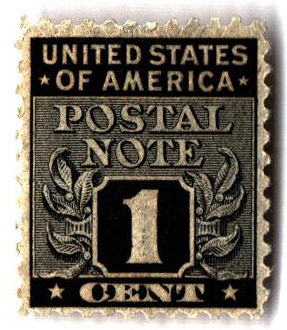 US #PN1 – The first Postal Note stamp. On March 31, 1951, Postal Note stamps were discontinued after just six years of use. Postal Note stamps were first introduced on February 1, 1945. They were used in a similar manner to money orders to send smaller amounts of money to anyone in the mainland Unites States. US #875 – Classic First Day Cover. 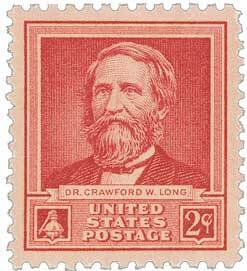 March 30 is celebrated as National Doctor’s Day in the United States to commemorate Dr. Crawford W. Long’s use of ether for the first time on this date in 1842. Crawford Williamson Long was born on November 1, 1815, in Danielsville, Georgia. The son of a senator, merchant, and planter, Long was named after Georgia statesman William H. Crawford. US #C117 was issued on this day in 1988. 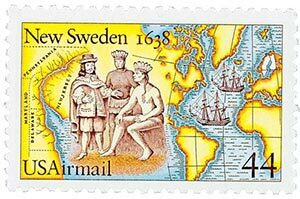 On March 29, 1638, the New Sweden Colony was established, encompassing parts of present-day Delaware, New Jersey, and Pennsylvania. In the 1600s, Sweden was a significant world power, with possessions including Finland, parts of Poland, Latvia, Estonia, Lithuania, Germany, and the Soviet Union. After hearing of the success the British and Dutch had in North America, Sweden sought to expand its territorial holdings. US #1260 was issued for the league’s 50th anniversary. 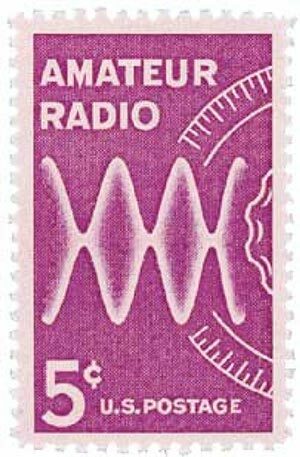 On March 28, 1964, amateur radio operators provided essential emergency communications in the wake of a devastating earthquake in Alaska. The idea for the American Radio Relay League came from Hiram Percy Maxim of Hartford, Connecticut. One night in April 1914, he wanted to send a message to a friend 30 miles away in Springfield, but was unable to reach him. From this, the idea struck Maxim to create an organized relay system for radio amateurs. US #4651-52 was issued for the 100th anniversary of this event. On March 27, 1912, US First Lady Helen Taft and wife of the Japanese ambassador Viscountess Chinda planted two Yoshina cherry trees on the northern bank of the Potomac River. The plantings were in celebration of the Japanese gift of 3,020 cherry trees to the US government. 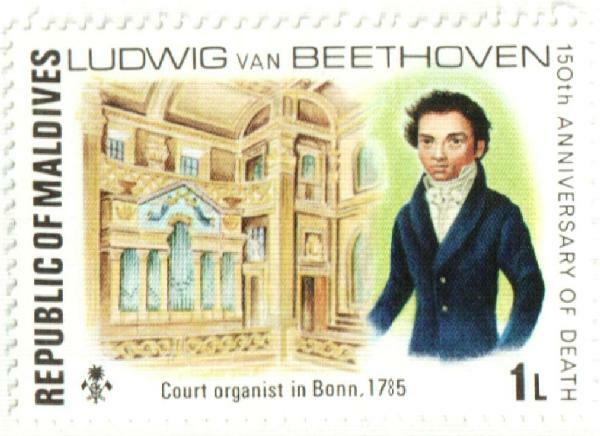 Maldives Islands #669 was issued for the 150th anniversary of Beethoven’s death. On March 26, 1827, legendary composer and pianist Ludwig van Beethoven died in Vienna, Austria. Beethoven’s exact birthdate is unknown, though some historians believe he was born on December 16, 1770, in Bonn, Germany. He was baptized on December 17, and at the time, it was customary for children to be baptized the day after they were born.